With October coming to a close, children all over America are excited about Halloween. But, for some Mexican-American families the excitement is less about Halloween and more about the two days following, which is the celebration of Dia de los Muertos. The first and second of Novemer are, respectively, All Saints’ Day and All Souls’ Day, holidays typically connected to the Catholic Church. However, Dia de los Muertos has roots that go much further back. Dia de los Muertos, or the Day of the Dead is a hybrid holiday combining Catholic beliefs with the Aztec beliefs that already existed in the area. Aztecs used to hold a month-long celebration for the goddess Mictecacihuatl, the “lady of death” (Day of the Dead History). They kept skulls of the deceased and displayed them during the holiday to symbolize the cycle of death and rebirth. When the Spaniards came over, they saw this practice as sacrilegious. After failed attempts to destroy the ritual, they shortened it and placed it on All Saints’ and All Souls’ Days, inextricably tying it to the Catholic Church. Over time, real skulls were replaced with wooden and sugar skulls, but the underlying idea of the ritualistic holiday remained the same. Upon arriving in the US with Mexican immigrants, like all cultural practices, the celebration of the Day of the Dead has undergone more changes. In Los Angeles alone, parts of society have appropriated the holiday with entirely different agendas, resulting in a varied group of events ranging from social action to tourist traps. This year, you can go to a celebration in Boyle Heights sponsored by Self-Help Graphics & Art, a non-profit organization trying to become the main incubator for socially conscious Latino artists, providing them working space, art classes, and support (Mission Vision Values). Along with the Day of the Dead’s expected festivities, local shops and artists who work with the organization will sell food, clothing, and art. You can also make your way to the Hollywood Forever Cemetery and, for $10 a person, watch a movie, hang out, and eat among the altars families construct. The size and fame of this event draws many people who would otherwise not celebrate the Day of the Dead and highlights the mixed blessing that is acculturation in the US. Although more people show interest and get involved in different cultures, Day of the Dead tends to become an exaggerated “Hollywood” event to attract tourists and their money, sometimes drawing in people who aren’t sensitive to the purpose of the celebration and use it as a second Halloween or another excuse to party. Dia de los Muertos has undergone many transformations with the migrations of people to and from Mexico. Along with maintaining its original significance, it demonstrates “Americanization” at its best and worst: political awareness and acceptance of different cultures, but also, commercialization and ignorance surrounding the other. 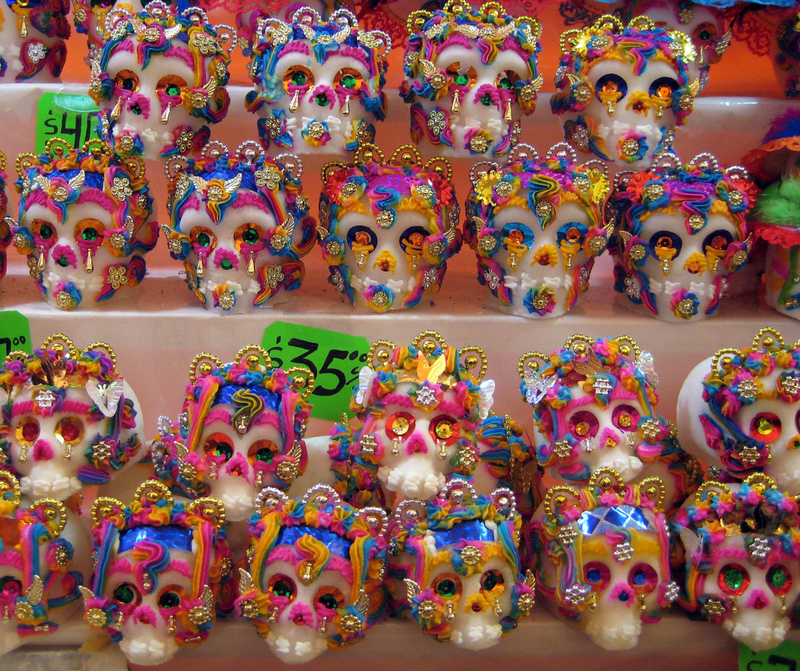 I truly experienced the Day of the Dead when I spent the holiday in Mexico. Before that experience, I did not imagine the Day of the Dead to be such a beautiful and solemn celebration. I went to the cemetery with my grandma to visit my great-grandmother’s grave. There was an array of different colored flowers around the cemetery, everything was full of life. I could sense the sincerity of the people, remembering their departed ones. November 1st (Day of the Little Angels [children]) and November 2nd are two days dedicated to reconnect with departed loved ones through praying and visitation to their graves, decorating them with colorful flowers that smell like life. When I returned to the United States, I attended an event for the Day of the Dead and the first thing I noticed was the series of little shops selling something; there was music, games, etc. The sentiment behind the holiday was not replicated. It was sad to see how people were not fully appreciating the holiday and were only using it as an excuse to party and make a business out of it. The solemnity is lost from one place to another.